Parashat Terumah opens with the free will contribution the people were to bring for the construction of the Tabernacle. The descriptions of the construction of the sacred things come from the gifts brought by the people. We are also told, the Lord had a specific design for the Tabernacle, which is related to the manner in which the people approach the Lord both physically and spiritually. We are told the tabernacle is to be wrapped in a wall made of curtains hooked together (similar to clothing), and the Ark of the Covenant is to be made of wood but yet covered in gold. The less precious (wood) was clothed in what is more precious (gold). These descriptions are analogous to sanctification, the process of making holy for the purpose of God. This may be paralleled to what the Lord is doing in our lives which is described at the beginning of the Torah, we are told, Bereshit / Genesis 1:26 Then God said, ‘Let Us make man in Our image, according to Our likeness; and let them rule over the fish of the sea and over the birds of the sky and over the cattle and over all the earth, and over every creeping thing that creeps on the earth.’ 1:27 God created man in His own image, in the image of God He created him; male and female He created them. (NASB) These Scriptures draw out this concept of the preciousness of mankind, as the Lord’s having made man after His image. Due to the nature of man having been made after God’s image, Paul wrote, in 2 Corinthians 3:15 But to this day whenever Moses is read, a veil lies over their heart; 3:16 but whenever a person turns to the Lord, the veil is taken away. 3:17 Now the Lord is the Spirit, and where the Spirit of the Lord is, there is liberty. 3:18 But we all, with unveiled face, beholding as in a mirror the glory of the Lord, are being transformed into the same image from glory to glory, just as from the Lord, the Spirit. (NASB) Paul wrote that those who turn to the Lord are in the process of being transformed into His image, as it says “from glory to glory” based upon the giving of God’s Spirit which is rooted in our freedom from sin. We are told in his letter to the Ephesians, 2:10 For we are His workmanship, created in Christ Jesus for good works, which God prepared beforehand so that we would walk in them. (NASB) These things draw us back to the Torah portion, Parashat Terumah and the descriptions of the construction of the Tabernacle. The Tabernacle, the ark of the covenant, the altar, the fire pans, all of these things were carefully crafted for the work of the Lord. Based upon the Scriptures, we know the cloths we wear are analogous to the righteous works of God. The Scriptures portray the proper clothing as being used for specific situations, as we see in the priestly garments. As a result of these things, proper attire is also repeatedly portrayed in the Scripture as a parallel to the righteousness of God’s people. Consider, When a generation of people move towards immorality they always become lax about covering themselves. (i.e. The debased condition of the Roman Empire is a well known example.) Such people eventually rebel against all restrictions, or moral law, and move toward wanton fleshly pleasures and activities. It is in this sense that one becomes addicted to the tickling of the ears to hearing a theology that is enabling the pleasures of the body. Such a person becomes enamored with their loose life style and will attack anyone or anything that gets between them and their fun. It is within this context that Christians are necessarily obligated to obey God’s Law as it is portrayed in the Scripture. Unfortunately, too many professing Christians do not know what the Scripture teaches and do not really care. The theologies of today provide the benefits of blessing and entrance into heaven, while at the same time enabling the believer in not having to comply with God’s law. Based upon the Torah’s descriptions on the construction of the Tabernacle, clothing is used to distinguish those of high office or those who have other special positions within the service of God. One’s clothing was meant to set them apart and reduces confusion on behalf of the Priesthood. The scriptures this week provide us with insight into the construction of the Tabernacle, and likewise, these Scriptures also give insight into who we are in the Messiah. In this week’s Torah portion, we are looking at Shemot / Exodus 25:1-15. In the opening verses to this week’s Torah portion, the Lord asks that a sanctuary be created for this purpose: ח וְעָשֹוּ לִי מִקְדָּשׁ וְשָׁכַנְתִּי בְּתוֹכָם: 25:8 ‘Let them construct a sanctuary for Me, that I may dwell among them. (NASB) It is interesting to note, the Lord God created the whole world in six days, but he used forty days to instruct Moshe about the tabernacle. Little over one chapter was needed to describe the construction of the world, but six chapters were used for the construction of the tabernacle. What might be said about the significance of this observation? If the Lord God of Israel dwells in the midst of His people, just as the Scriptures teach, then the way we conduct ourselves as His children is vitally important. If God is holy, then we must also be holy (1 Peter 1:16). This provides us with a very strong reason for obeying the commands of God. We must seek to practice righteousness and holiness if the Lord God is dwelling in our midst. Furthermore, if the Lord God is in our midst and manifests Himself in and through us, then the way that we conduct our lives is again, vitally important as our lives are a representation of the God of Israel and His ways to all the world. It is for this reason Paul wrote, “I am writing these things to you, hoping to come to you before long; but in case I am delayed, I write so that you may know how one ought to conduct himself in the household of God, which is the church of the living God, the pillar and support of the truth” (1 Timothy 3:14-15). In the first epistle to Timothy, Paul writes about purity of conduct in the ekklesia (1 Timothy 1), of public ministry (1 Timothy 2), about leaders (1 Timothy 3), about false and true holiness (1 Timothy 4), about our responsibilities to the poor and widows (1 Timothy 5), and about the pursuit of prosperity under the guise of seeking greater piety (1 Timothy 6). Note the significance of how we conduct ourselves and how vitally important this point is for us as the Lord God of Israel indwells our hearts and is walking in our midst today! This week’s Torah portion calls us to be very careful in the way that we keep our hearts as a sanctuary for His glory, so that His glory might be manifest to others. Rashi states the following concerning the pattern of the dwelling place of God (the Tabernacle). ככל אשר אני מראה אותך ACCORDING TO ALL THAT I AM SHOWING THEE here, את תבנית המשכן THE PATTERN OF THE DWELLING. — This verse must be connected with the verse that precedes it, thus: And let them make for Me a sanctuary … according to all that I am showing thee (the words ושכנתי בתוכם being a parenthesis). The concept here is the Lord instructed Moshe on the exact nature of His Tabernacle, the pattern must be followed to the level of detail the Lord had shown Moshe. This is important because it speaks of God’s dwelling in the midst of His people and the manner in which the people are to conduct themselves because we are His people. The pattern for the construction of the Tabernacle was very important because it represented the exact manner in which man was to approach the Lord God in heaven. Why do you think it is today the pattern for the way the Lord wants us to live our lives is not emphasized and followed to the level of detail as described in the Scriptures? וכן תעשו AND SO SHALL YE MAKE IT also in future generations (cf. Sanhedrin 16b); if one of the vessels is lost, or when you make for Me the vessels for the “House of Eternity” (another name for the Temple in Jerusalem), — as e. g., the tables, candlesticks, lavers and stands which Solomon had made — you shall make them after the pattern of these (the vessels of the Tabernacle), If, however, the verse were not to be connected with the preceding one but formed a new statement, Scripture ought not to have written: וכן תעשו “and so shall ye make them” but כן תעשו “so shall ye make them” and then it would be speaking of the making of the tent of meeting and its vessels and not of the vessels of the Temple, and the translation would be: according to all that I am showing you the pattern of the Tabernacle and the pattern of all its vessels, even so shall you make them. Note how Rashi describes the future generations and the vessels in the context of the Temple in Jerusalem which is called the “House of Eternity.” This describes the everlasting nature of God’s ways, and the manner in which we are to approach Him. Rashi says these Scriptures apply to both the Ohel Moed (Tent of Meeting) and the Temple in Jerusalem. Rashi speaks of the significance of the Lord telling Moshe to construct the Tabernacle in the pattern that He had shown him. Similarly, we should be taking a close inspection of our own lives to see if we are living in the pattern that He has laid out in Scripture. 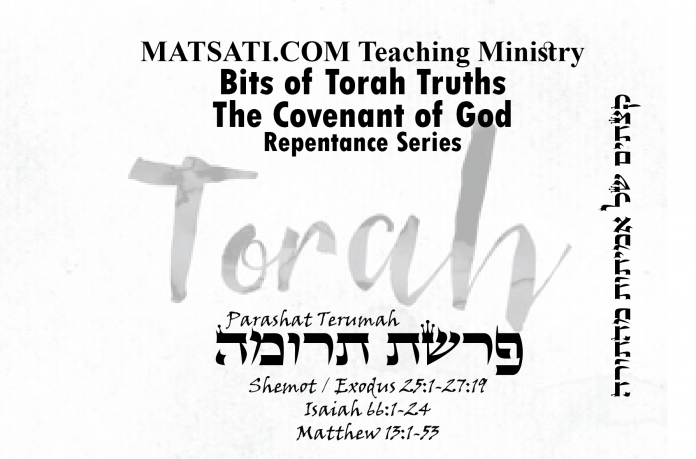 The commentary Kedushat Levi on Shemot / Exodus Terumah 4 takes more of a spiritual application of these Scriptures as they are applied to our lives today. Exodus 25:9“in accordance with all the pattern I show ‎you; the pattern of the Tabernacle and the pattern of all its ‎furnishings so you shall make it.” Rashi (Sanhedrin ‎‎16) comments on this verse that these instructions, i.e. that just ‎as the building of the Temple was to be approved by Moses who ‎represented all the judges of the High Court, the building of ‎future Temples would also have to be approved and supervised by ‎the judges of the High Court. Tossaphot on that folio already raises questions ‎concerning this interpretation; they point out that the ‎measurements of the altar of the Tabernacle did not correspond ‎to the measurements of the altar in Solomon’s Temple (Kings I ‎chapters 6-7) Nachmanides also found difficulty with ‎‎Rashi’s commentary in Sanhedrin. When ‎‎Rashi explained the word ‎לדורות‎, to describe the meaning of ‎וכן תעשו‎, he meant that the same yardsticks that applied in the ‎desert when the Tabernacle was being built were also to be ‎applied in future generations when a Temple will again be built. ‎The tangible version of the people’s service of G’d is to conform ‎to the manner in which the subject would be communicated to ‎the prophet or High Court that is the highest spiritual authority ‎of the people at the time. the word ‎לדורות‎, to describe the meaning of ‎וכן תעשו‎, he meant that the same yardsticks that applied in the ‎desert when the Tabernacle was being built were also to be ‎applied in future generations when a Temple will again be built. ‎The tangible version of the people’s service of G’d is to conform ‎to the manner in which the subject would be communicated to ‎the prophet or High Court that is the highest spiritual authority ‎of the people at the time. This speaks of the Lord having a specific design for the Tabernacle, which is related to the manner in which the people approach the Lord both physically and spiritually. This directs us to understand the purpose of the commandments as being the way the Lord God wants us to live our lives. This manner in which the Lord wants us to live may be illustrated according to Tehillim / Psalms 112:5-6 which states, ד זָרַח בַּחשֶׁךְ אוֹר לַיְשָׁרִים חַנּוּן וְרַחוּם וְצַדִּיק: ה טוֹב אִישׁ חוֹנֵן וּמַלְוֶה יְכַלְכֵּל דְּבָרָיו בְּמִשְׁפָּט: 112:5 It is well with the man who is gracious and lends; He will maintain his cause in judgment. 112:6 For he will never be shaken; The righteous will be remembered forever. (NASB) This describes the one who does charity (Tzedakah) which is derived from the Hebrew text meaning righteousness, fairness or justice. Tzedakah is often translated as charity in Judaism and is a mainstay of Jewish life. The sages teach that the world was built upon kindness. However, tzedakah goes one step beyond. Literally translated as “justice” or “righteousness,” tzedakah tells us that sharing what we have with others isn’t just something special, it is the honest and just thing to do. In addition, Tzedakah is not limited to gifts of money but may also be performed by the sharing of our time with others, showing love in the same way the Lord has shown us love. Charity is a fundamental part of the Torah way of life, this is why the Targum translates 112:2 His children will be mighty in the Torah, he will be blessed in the generation of the upright. (EMC) Giving to the poor is an obligation in Judaism, a duty that cannot be forsaken even by those who are themselves in need. If these things are true, why then does Christianity not consider tzedakah obligatory? Some sages have said that tzedakah is the highest of all commandments, equal to all of them combined, and that a person who does not perform tzedakah is equivalent to an idol worshiper. It does not matter whether a limited amount of resources are provided to God’s people or whether wealth has been distributed unevenly in the earth. Some nations (or people) have been given a greater share and some a lesser share. But since all are created equally in the image of God, there is a duty that develops out of the Scripture for God’s people who “have” are to give of their substance to those who do not “have” in order to effect justice. This is the definition of tzedakah. It is a way of looking at the world and understanding the human role in helping others where by doing so one is imitating the qualities of the Lord in heaven. Flee the evil desires of youth, and pursue righteousness, faith, love and peace, along with those who call on the Lord out of a pure heart. Don’t have anything to do with foolish and stupid arguments, because you know they produce quarrels. And the Lord’s servant must not quarrel; instead, he must be kind to everyone, able to teach, not resentful. Those who oppose him he must gently instruct, in the hope that God will grant them repentance leading them to a knowledge of the truth. So do not worry, saying, What shall we eat” or What shall we drink” or What shall we wear? For the pagans run after all these things, and your heavenly Father knows that you need them. But seek first his kingdom and his righteousness, and all these things will be given to you as well. The bedrock of who we are is to have absolute faith in God, from which leads to ethical and righteous actions in our lives. Through faith in the Messiah in the belief that Yeshua died for our sins and thereby provided atonement for us, we are given the mercy and salvation of God in this life and in the next (see Ephesians 1:6-8). The Torah context draws in the concept that our deeds will be consistent with our faith. Faith in the God of Israel rescues us from worldly temptations, while those who trust in the Lord and His mercy will repent of their transgressions, forgive others, and open their heart to do what the Lord has called us to do on this Earth. The Scriptures teach that those who do so will be saved (see Matthew 13:15, Acts 2:38, 10:42-44, and 13:37-39). It is within this context that we find Parashat Terumah and the construction of the Tabernacle. It is also within this context that we understand Christians are necessarily obligated to obey God’s Law as it is related to Morality, Ethics, Justice, and Righteousness. Unfortunately, too many professing Christians do not know that the Scripture teach these things. The modern theologies of today keep one in immaturity of faith providing the benefits of blessing and entrance into heaven, without the responsibilities we are called to according to God’s law. Based upon the Torah’s descriptions on the construction of the Tabernacle, we see how the Lord God has a specific (exact) design for our lives. Just as clothing was used to distinguish those of high office or those who have other special positions within the service of God. God’s righteousness (His ways) are meant to set us apart and reduce confusion on behalf of who we are as God’s people in a wicked world. The scriptures this week provide us with insight into the construction of the Tabernacle, and likewise, these Scriptures also give insight into who we are in the Messiah.